After leaving the western coast of NL we drove up to Twillingate, near the tip of a peninsula off the northern coast. 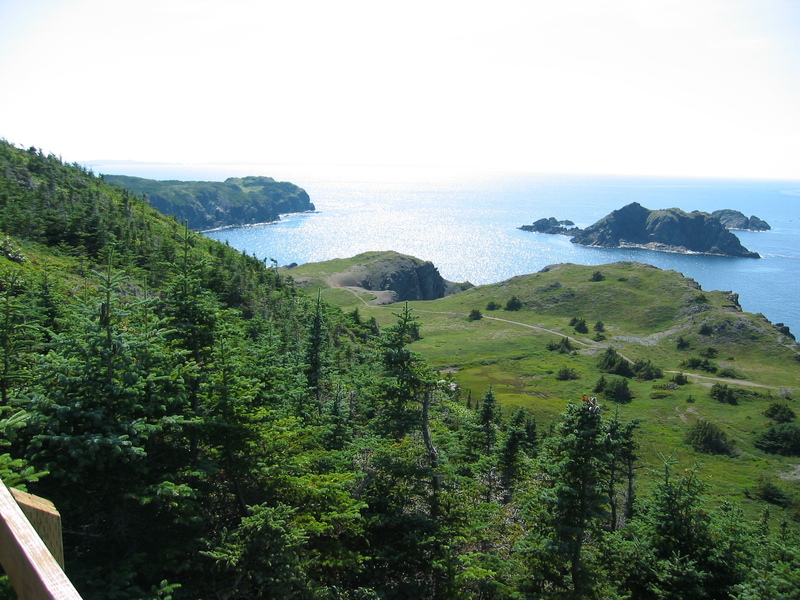 This photo was taken from a lookout at North Twillingate (the end of the road as you drive up the peninsula – where the lighthouse is!). We slept in the parking lot by the lighthouse that night. 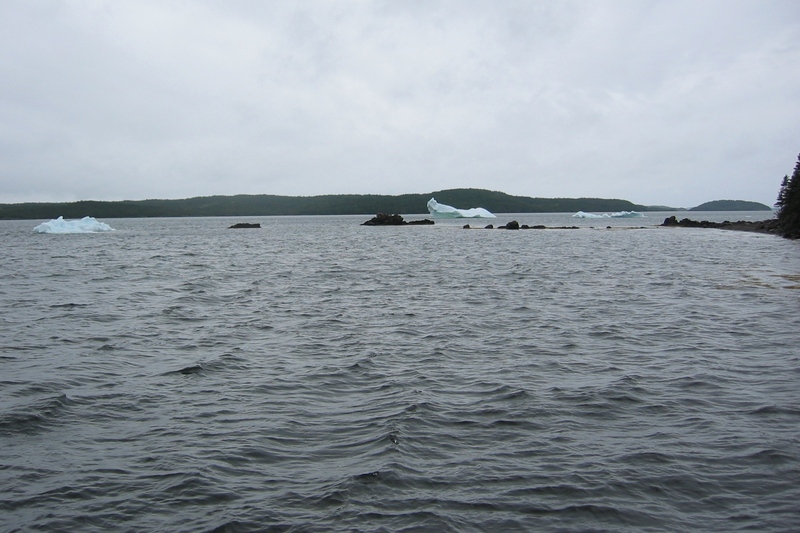 The area is beautiful and known for whale and iceberg sightings. 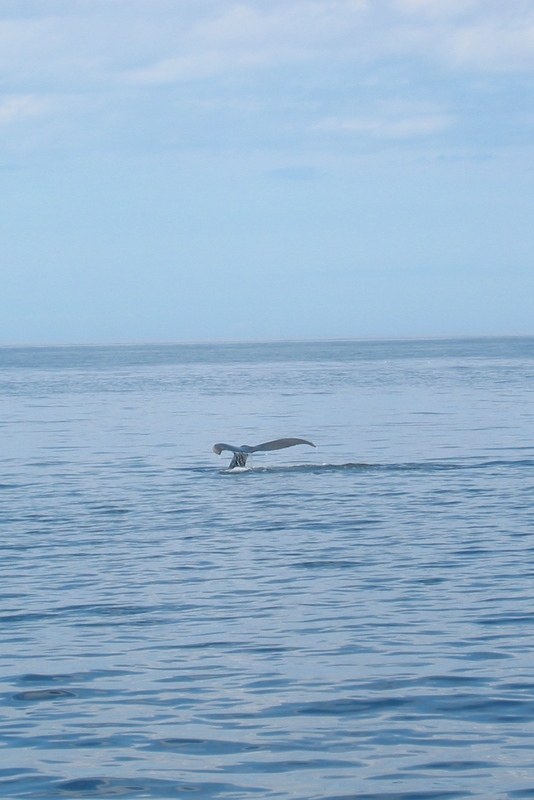 We were lucky enough to arrive in the area just in time to catch a whale watch boat tour on a beautiful afternoon. 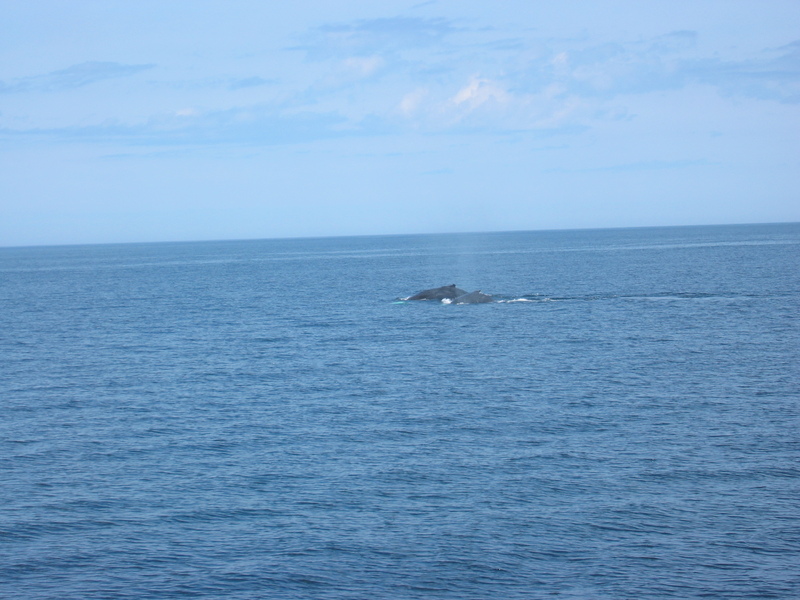 The whales were active, and we saw a mother and her calf swimming together at one point. Here’s my best whale tail shot. Later on we passed a restaurant with a lake, boat and fake fisherman, with a fake whale tail sticking out of the water. We met some interesting people, and ran into some folks we had seen earlier – it has been interesting that throughout this trip (at least within PEI/Nova Scotia/Newfoundland) we have run into people over and over again. We even saw a “caravan” of Airstreams from Texas – a set of RVs that travel together and pay someone money to make all the travel arrangements. We saw them later, and they had almost reserved an entire large campground! Some other full-timers we met from Illinois just shook their heads at the notion of not having the freedom to spend as much time as two people could agree to spend at each stage of the trip. They said they were camped with them and could hear complaints from each campsite ranging from “wish we had more time here” to “glad we’re moving on”. One of the folks we saw at a local Walmart overnight told us that an iceberg had washed ashore (flown into a harbor where it was slowly melting) nearby. An enterprising fisherman had been taking people out in his boat to see it for free (he would need a permit to charge them for the trip – but was glad to take tips.) By the time we drove back down through the town, we saw that his wife had made several signs pointing to the “best view of the iceberg” from the main road, and his son had carved off several small pieces that he was giving away. While we were chatting with him we heard a loud “crack” that the guy originally thought was the iceberg making noise, but it turned out to be another fisherman whacking the heads off the fish he had caught that day. We heard from him (as we had heard from others) how overfished NL shores were from foreign shipping boats, and that the limits imposed by Canada on the size of the catch per boat trip was difficult. He fished for seals, mackeral, cod, crabs, and squid. Chris bit her tongue rather than admit she’d been a proud member of Greenpeace since she was 10. Here’s a photo of the iceberg pieces in the cove, by the time we got there…yes, we have two pieces in the freezer of the RV.